Long Island's Bayside do not sound like the latest influx of bands from the utopian suburb of NYC, and thank God for that. Instead, Bayside's darker punk and eerie rock lies somewhere in between AFI and Alkaline Trio, where meaningful melancholy lyrics and muscular music meet. Imagine Morrissey with a lot more testosterone, and you've got an idea of where this quartet is coming from, as songs like "Alcohol and Altar Boys" and "How to Fix Everything" sound as if they were ripped from a John Cusack movie's soundtrack. 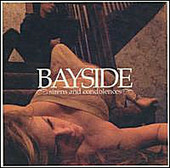 If you enjoy the sound of hearts breaking behind a punk music backdrop, Bayside has everything you're looking for.